The first purpose of this experiment was to determine the effect of human development and land use on the amount of benthic macro invertebrates in streams. The second purpose of this experiment was to determine the effect of human development and land use on the pollution level according to the variation of benthic macro invertebrates in the stream. The third purpose of this experiment was to determine the effect of human development and land use on the amount of dissolved oxygen, conductivity, pH level, and temperature in streams. I became interested in this idea after seeing numerous streams that varied in color and how clear they were. I knew the land around them was being used by humans for farming, as a place to live, and as land for factories. I also knew that some benthic macro invertebrates would live in them and was curious how the land use affected the bugs and other water quality characteristics, which these macro invertebrates need to live. The information gained from this experiment could benefit fishermen. It would also affect where people use water for swimming or other recreation. My first hypothesis was that the amount of macro invertebrates would be greatest at the urban site, least at the agricultural site, and between the two at the industrial site. My second hypothesis was that the variation of macro invertebrates would be greatest at the urban site, least at the agricultural site, and somewhere in the middle at the industrial site. My third hypothesis was that the water quality parameters would vary depending on the site. I based my first hypothesis on a statement in the article “Water Pollution” saying, “Farms also frequently use large amounts of chemical fertilizers that are washed into the waterways and damage the water supply and the life within it. Fertilizers can increase the amounts of nitrates and phosphates in the water, which can lead to the process of eutrophication.” It also said “Many industrial and power plants use rivers, streams and lakes to dispose of waste heat. The resulting hot water can cause thermal pollution. Thermal pollution can have a disastrous effect on life in an aquatic ecosystem as temperature increases decrease the amount of oxygen in the water, thereby reducing the number of animals that can survive there.” I also based it on my own knowledge that benthic macro invertebrates prefer cold water that contains abundant dissolved oxygen. I based my second hypothesis on the fact that if there were more benthic macro invertebrates, it was extremely likely that the bugs will also vary more and if there are more bugs, the pollution level will probably be less. I based my third hypothesis on the statement above from the article “Water Pollution” and “Sewage generated by houses or runoff from septic tanks into nearby waterways, introduce organic pollutants that can cause eutrophication,” from the same sight. I also based it on many statements by Chris Coffin saying that the tests can change depending on what development is upstream from the site. The manipulated variable was the kind of human development upstream from the site. • Amount of benthic macro invertebrates found in each stream via a visual count for each sample. • Pollution level according to the variety of benthic macro invertebrates in each stream. To determine this I calculated the Sequential Comparison Index. • Dissolved oxygen level using the Winkler test method. 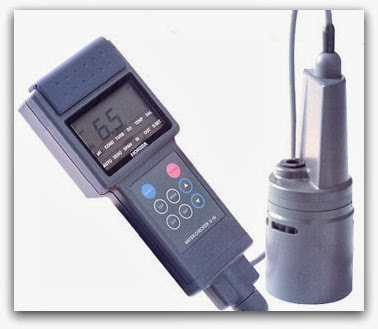 • pH level, measured with an electronic pH meter. • Conductivity level using a conductivity meter. • Temperature measured with an electronic long-line thermometer. 3. Calibrate pH meter and conductivity meter according to their instructions. 4. Drive to the agricultural site at West Valley Park. 5. Note the wildlife and plants on the banks of the creek. 6. Put on hip waders. 7. With D-frame net and vegetable brush in hand, wade to a riffle spot in the water. 8. Place net in the water bottom with the opening facing the current. 10. Pick up any large rocks inside the frame. 11. Hold the rocks just in front of the net. 12. Use brush to dislodge any macro invertebrates into net and toss rocks to sides of net. 13. If any rocks are directly under the frame, brush them off. 14. After all large rocks are removed, kick in gravel for two minutes (using stopwatch) while holding pole for support. 15. Splash water into the net to knock any clinging organisms into bottom of net. 16. Go back to the shore and fill a baggie with about two liters alcohol solution and put it over the tray. 17. Carefully dump the contents of the net into the baggie over the tray. 19. Put this baggie into another baggie and label it. 20. Close the outer baggie and put it into the cooler. 21. Walk about 5 meters upstream from the benthic sampling site. 22. Wade into center of the water with a DO bottle, the DO bottle filler, and a stopper. 23. Rinse this equipment three times in the creek. 24. Put cut out end of the filler facing current until water starts to come out of tubing. 25. Quickly put end of tubing into bottom of the DO bottle and angle filler vertically. 26. Let the bottle overflow. 27. Before the filler empties, pull it out of the bottle. 28. Insert the stopper and pour off extra water above the stopper. 29. Record the DO bottle’s number and its site. 30. Repeat steps 22 – 29 with a new DO bottle and stopper. 31. Put on a pair of disposable gloves. 33. With a syringe, insert two milliliters of manganous sulfate into each sample. Keep syringe with reagent for the other sites. 34. With another syringe, insert two milliliters alkaline-azine solution into each sample. Keep the syringe with reagent for other sites. 35. Insert the stoppers, pour off any excess, then put on the plastic caps. 36. Dispose of the gloves. 37. Put a 1-liter bottle under surface of the water with opening in current until it fills up. 38. Rinse off the probe with demineralized water three times. 39. Turn on the conductivity meter and put the probe into this bottle. 40. Wait until reading becomes steady and record results in microSiemens per centimeter. 41. Triple-rinse the end of the pH meter. 42. Put the end of the pH meter into bottle about 3 centimeters under the surface. 43. Gently stir water with pH meter wait for reading to become steady. 45. Uncoil the line on the thermometer and make sure it is set to Celsius. 46. Put probe into the current of the stream. 47. Wait for the reading to steady. 49. Drive to urban site at Randall Park. 50. Repeat steps 5 – 49. 51. Drive to industrial site at Union Gap’s, Main Street. 52. Repeat steps 5 – 49. 53. Drive to Department of Ecology laboratory. 54. Take off the hip waders. 55. Put on the face mask, plastic apron, and gloves. 57. Take caps and stoppers off each DO bottle after the flocculants have settled. 58. Carefully put two milliliters of sulfuric acid into each of the six bottles. 59. Put the volumetric flask into the end of the DO bottle and flip it over. 60. After flask has filled, overturn volumetric flask into an Erlenmeyer flask until it is empty. Be sure to keep DO bottle with its Erlenmeyer flask. 61. Rinse the volumetric flask in the sink. 62. Repeat steps 59-61 until all of the bottles have been used. 63. Take off the face mask and put on the safety glasses. 64. Insert two milliliters aqueous starch solution into each Erlenmeyer flask with a syringe. 65. Put a stirring bar into each of the flasks. 66. Put magnetic stirrer under the graduated burette and turn the stirrer on to medium. 67. Fill sodium thiosulfate bottle with sodium thiosulfate and put lid on with connected tubing. 68. Squeeze the bottle to fill up the graduated burette. 69. Put an Erlenmeyer flask onto the magnetic stirrer under the graduated burette. 70. Wipe off any extra drops under the graduated burette. 71. Slowly turn the stopcock to let sodium thiosulfate out. 72. Continue until the sample is clear. 73. Read the amount of sodium thiosulfate used on graduated burette. This is number of milliliters per liter of dissolved oxygen. 75. Repeat steps 68-74 for each flask. 76. After at least twelve hours, get the benthic samples out of the cooler. 77. Put one of the baggie’s contents handful at a time into the depression on the top of the lid, separating the bugs from the gravel using the forceps and magnifying glass. 78. Grid the tray in two centimeter squares with the permanent marker and ruler. 79. Put the macro invertebrates from the same sample into the tray. 80. Put about one centimeter of water in with these macro invertebrates. 81. Randomly choose a square and pick up the macro invertebrate with the forceps. 82. Record this as “x” over 1. 83. Pick up another macro invertebrate from same square or another random square if there are none in same square. 84. Through the magnifying glass, see if this is the same species, or close to the same. If it is the similar, put it as another “x” over the same number, or record it as an “o” over two, indicating a new run. 85. Continue randomly selecting squares and comparing until there are no more organisms left in the group. 86. Count the number of x’s and o’s to find the number of organisms. 87. To count the runs, simply see the last number on the bottom. 88. Divide number of runs by number of organisms to get Sequential Comparison Value. 89. Compare to the index below and sort. 91. Repeat steps 77-90 until all of the samples are done. The second purpose of this experiment was to determine the effect of human development and land use on the pollution level according to the types of benthic macro invertebrates in the stream. The results of the experiment were that there was the most traced pollution in the water at the industrial site with the highest temperature, lowest dissolved oxygen, normal pH, but high conductivity. The urban site and agricultural site had the least traceable pollution with low temperatures, high dissolved oxygen, average conductivity, and normal pH. The benthic macro invertebrate data contradicts with this. The agricultural site has the most macro invertebrates, urban has the middle amount, and the industrial site has the least. The sequential comparison score has the industrial site, urban site, then agricultural site in order from greatest to least. My second hypothesis was that the variation of macro invertebrates would be greatest at the urban site, least at the agricultural site, and somewhere in the center at the industrial site. My third hypothesis was that the water quality tests would all vary depending on the sites. The results indicate that my first hypothesis should be rejected because the amount of macro invertebrates went from greatest to least as following: agricultural, urban, and then industrial. The results indicate that my second hypothesis should be rejected because the pollution level according to the variety of macro invertebrates went from greatest to least with: industrial, urban, and agricultural. My third hypothesis should be accepted because the tests were not the same. After thinking about the results of this experiment, I wonder if the results would have been the same in a different season. I wonder if it would make a difference if there had been a different water level because I know it was not normal height. I would also be curious how sampling after certain farms, industries, or houses would affect the data. I would possibly use a dissolved oxygen meter and a more accurate pH meter. To make it a little simpler, I may have not done all of the tests so I could focus on only one parameter or just the macro invertebrates. If I were to conduct this project again I would have sampled a larger area for macro invertebrates and possibly used a different method for measuring these. I also would have tested for temperature, conductivity, dissolved oxygen, and pH in many more samples. I would have measured in many seasons and at the same time of day on different days instead of all on the same day. I would have calculated the biochemical oxygen demand and probably tested in the sediment. I would have tested on more than one stream on a regular basis to try to locate a pattern. Possibly, I would have found the fish population in my stream.